Nixon, Reagan, bushit uno and duo, the clintons before after nine-eleven, a major portion of the bh0 gop poisoned administration and now our gloriUS whole Trump against whom is -how ironic:) - increasingly held by federal and prosecutors all the trump cards but the 0ne that has the most $hit on it. Then there's John Negroponte ... this post is only just beginning to feel cathartic.... today's refugees fleeing dysfuntional corportUSt$-made governments in Latin America and the Caribbean are Elliot Abrams and Juan Negroponte's ideological progeny, innocent souls born from and into terrorUSt$' American Empire whose tentacles menace the globe with impunity in gloriUS self-absolution. Elliott Abrams was once an innocent child. And then he decided to spend the rest of his life covering up brutal atrocities and defending right-wing dictatorships. Elliott Abrams once said the animating force behind his and Ronald Reagan’s foreign policy was that the world is “an exceedingly dangerous place.” And this is true, largely because men like Elliott Abrams exist in it. It should go without saying that the idea the Trump administration is pursuing regime change in Venezuela for the sake of democracy and human rights is as laughable as calling Jamal Khashoggi’s murder a surprise party gone wrong. But in case you need to explain this to politically confused friends and relatives, here are eight good reasons why the appointment of Abrams, in particular, makes a mockery of any such high-minded rhetoric. 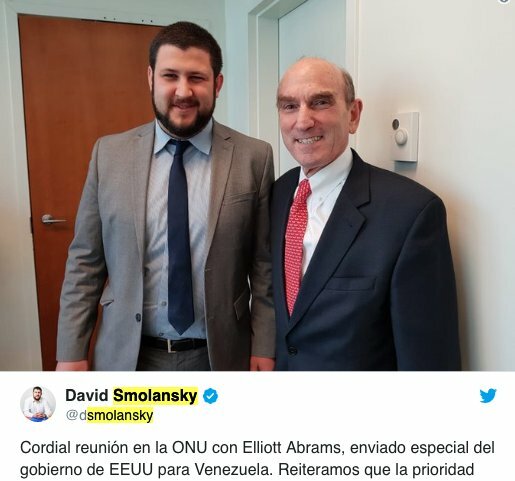 While Guaido tries to seize power in Venezuela, David Smolansky, co-founder of Guaido's Popular Will party, is in the US scheming with Trump's #Venezuela point man Elliott Abrams: Iran-Contra war criminal who armed right-wing death squads in Nicaragua, El Salvador & Guatemala.